Mount Rushmore is a memorial and an impressive monument to American history. 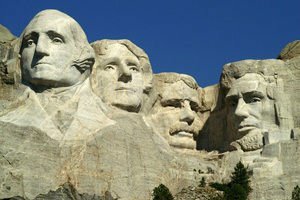 There the rocks have carved images of the four U.S. Presidents - George Washington, Thomas Jefferson, Theodore Roosevelt and Abraham Lincoln. The impressive sculptures in the Mount Rushmore were carved on the southeastern slopes of the hills in the U.S. state of South Dakota and are standing on the heights above 1737m of the Black Hills. The four former heads of state of the U.S. are white rocks carved into a symbol of freedom, democracy and the American dream. The Memorial monument is visited by more than 3 million visitors a year. The first, which began building the huge statues in the Mount Rushmore was, Gitzan Borglam, which together with 400 workers worked tirelessly during the summer and winter. The beginning was launched in 1927. Nearly 90% of Mount Rushmore is sculpted with dynamite explosions. Details on the faces of presidents were shaped with a pneumatic hammer. Although there were extremely hazardous working conditions, workers who descended down the rocks tied with wire ropes, all returned home with no deaths during the 14 years building and sculptural activities there. The first completed image was of Washington, which was opened on July 4th, 1934. Two years later, President Roosevelt and the image of his predecessor Thomas Jefferson was opened. On the occasion of the 150th anniversary of the U.S. the constitution was completed and the monument of Lincoln on September 17th, 1937 was revealed. Formally the monument was opened on October 31st, 1941. However, the overall plan of the sculpture was not met because it was planned to carve the presidents from head to waist in rocks. Work had been suspended because of the sudden death of Borglam. Later his son was trying to finish the work, but the financing of the project was stopped because the money was going for the resources of World War II. The entire memorial complex of Mount Rushmore was built with the primary objective to attract more tourists to the Black Hills. Most visitors are there in the summer, around June and August, but a more appropriate time to visit is April-May, or the period from September to October.